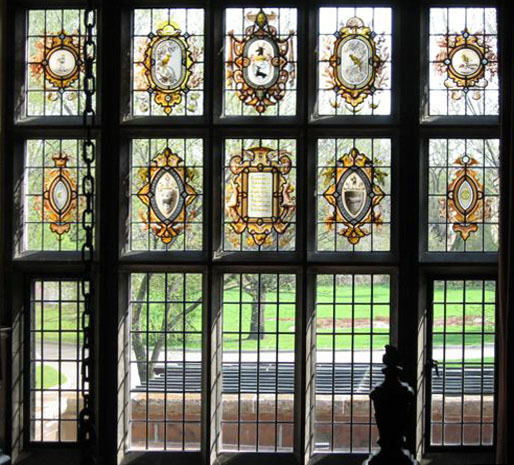 Biography: Lewis W. Simpson (1869-1971) designed most of the stained glass of Fair Lane, the estate of Ford Motor Company founder Henry Ford. Born in Kent, England, Simpson became an apprentice architect in Norwich, England where he learned Gothic architecture through the reconstruction of ancient churches. He worked for architects Sir Arthur W. Blomfield in London and Ralph Adams Cram and Bertram Goodhue in New York City before being hired by Pittsburgh-based architect William Van Tine, who wanted someone familiar with English mansion design to assist with the Fair Lane project. After the completion of Fair Lane, Simpson remained in Dearborn, working primarily on church architecture with Detroit architect W. E. N. Hunter until his retirement in 1954. His work during this period included architectural designs for Historic Trinity Lutheran Church in Detroit and Christ Episcopal Church in Dearborn, among others. After retiring, Simpson moved to Maryland where he lived until his death in 1971. See the Window of the Month, May 2010.